Gracefully positioned at the heart of the school estate, Chapel plays a central role in the daily life of the school and represents its Christian foundation. It is a place of daily and weekly prayer, a focus of affection for Old Barnardians and witness to all the moods of community life – from the exuberant end-of-term ‘Nailing Up’ ceremonies to reverent observance of Remembrance Sunday; from the annual Founders’ Day service to harvest and Christmas celebrations. 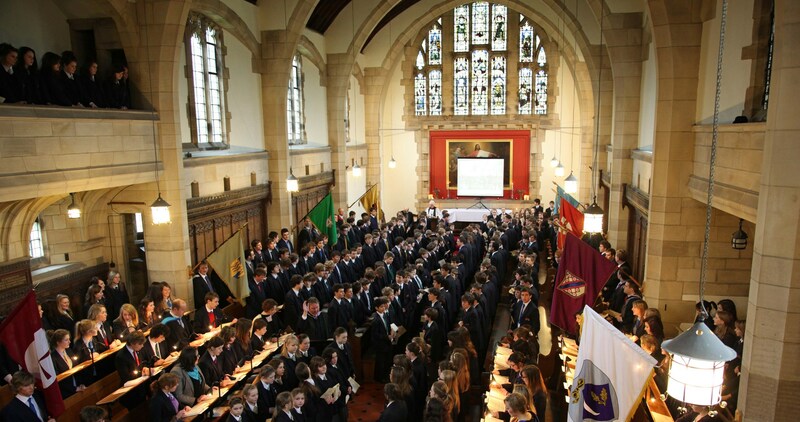 The Chapel opened in 1912 and, in addition to being a vibrant contributor to school life today, also commemorates former staff and the Old Barnardians and masters who made the ultimate sacrifice for their country. Generations of Old Barnardians return for special occasions and requests for OB weddings and baptisms are commonplace, such is their affection for Chapel. The Chapel is not affiliated to any Church, but its typical rite is Anglican and the Bishop of Durham regularly visits to confirm and give first communion to many of our younger girls and boys. Chapel spirituality reflects the dictum that “the glory of God is a human being fully alive”, and provides us all with the values that help us to live and work together as a community. If a pupil takes issue with a sermon, finds beauty in an organ voluntary, is touched by a prayer, weeps at a leaving service, feels exhilarated by ‘house shouts’ or is prompted to give generously to a local or national charity – then he or she becomes more fully human. We are glad of a Chapel and a Chaplaincy which present such opportunities for reflection to all our pupils.